NHL free agency is not match with a free spending in NBA, but there has been interesting developments with trades, expansion draft, entry draft, re-signs and free agent signings during last few weeks. Accuscore uses its own player analytics to evaluate winners and losers since start of June. As this advanced player analytics cover only NHL players, we don’t take into consideration entry draft impacts. Las Vegas Golden Knights starts first season in NHL. As there is no historical record of the team, we have excluded them from this analysis. 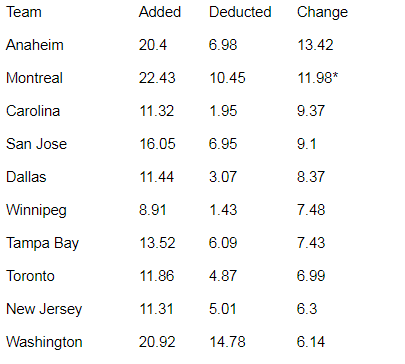 However, all players that have departed from other teams during expansion draft, impact in their last season teams. The table below shows top teams that have improved most during last weeks. This includes also their current players that they have re-signed during this period. As goalies are the most important single players in every team, those changes are clearly part of many top teams transactions. Anaheim signed one of the top goaltenders, Ryan Miller that is greatly improving their position when looking purely numbers. Re-signatures of Patrick Eaves and Cam Fowler are other remarkable transactions to raise Ducks to top of our list. Montreal made one move that reflects here above anything else. Carey Price extended his stay in Montreal with 8-years contract. Without this, Montreal’s combined rating would be -1.78 and considered not so great result of first days of free agency. Carolina and San Jose are on the list mainly due to many core players’ new contracts. Carolina added Justin Williams and Trevor van Riemsdyk which will improve team at least for the next season. San Jose couldn’t keep Patrick Marleau, but all other key members stay with the team. Dallas has been splashing over 11 millions of the next season’s cap hit to jumpstart the offense that was not able to keep up with the pace year ago. Alexander Radulov and Martin Hanzal would provide needed boost for Stars. Dallas is basically improved most when we concentrate only on free agent signings. Winnipeg and Tampa Bay are in top10 only due to contracts of goalies - Steven Mason and Peter Budaj respectively. Without those additions, that many don’t consider great goalies, these teams combined rating would hover around zero. Toronto has done reasonably good job since end of the season. They have acquired players that are all above “threshold” player. This “threshold” player is generally player that can be signed from free agent pool during the season. Sounds trivial that you would sign better players during off-season, but that hasn’t happen for many teams. Another team that has done good job is New Jersey. With the re-signed goalie Keith Kincaid and recent trade of Marcus Johansson, they can expect much better result from the upcoming season than we have seen during last season when Devils have been in the basement of their division. As the free agency is at the end more or less zero sum game, there must be some teams that have not improved, but regressed when we are looking for advanced player analytics from the last season. Minnesota is doing partial house cleaning after quick exit from the playoffs first round. Even though they recorded best regular season results in franchise’s history, there are notable core players that have been traded or let to go during last weeks. Moreover, the nucleus of the team is still in place and the expectation is that this team will fight in the playoffs during upcoming season as well. Florida’ season was a disappointment already in regular season. The biggest setback for them is the departure of young center Jonathan Marchessault who was their best player (except goalies) during the last season according to Accuscore’s advanced player analytics. Thomas Vanek and Jaromir Jagr will be missed from Panthers offense in the next season as well. In Chicago there has been some departures of relatively good players, but only the return of Brandon Saad from Columbus can be considered as an improvement. 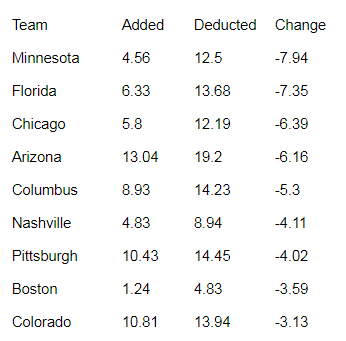 As Chicago has been Stanley Cup contender year after year, this small regression during last weeks won’t have big impact to the next season’s target. That would be bringing Stanley Cup back to the windy city. Arizona’s number is impacted by the departure of the goalie Mike Smith. They have added only one player that can be consider below “threshold” player and by that they actually have improved their team. It would be interesting to see how well one of the best backup goalie Antti Raanta will do in the desert. Columbus added russian magician Artemi Panarin from Chicago, but that won’t cover all departed core offensive players. Saad, Hartnell and Gagner will be missed in Columbus. Especially if team is not repeating the great run of the dark months of the regular season like they did this year. Nashville and Pittsburgh seem to have normal traffic of the team that has been fighting in Stanley Cup finals. Both teams lost good players in expansion draft, but returning to finals next season won’t be any surprise for these teams. Colorado has been quiet during free agency. That is a bit surprise for a team that won only 22 games during last season and hasn’t won playoffs series in 10 years. Signing Nail Yakupov is not answer for the future. As the free agency continues, some teams may improve their positions before the start of the season. Also development of the young players and top draft picks will influence on teams that are relying more on junior scouting and drafting than improving the team through free agency.